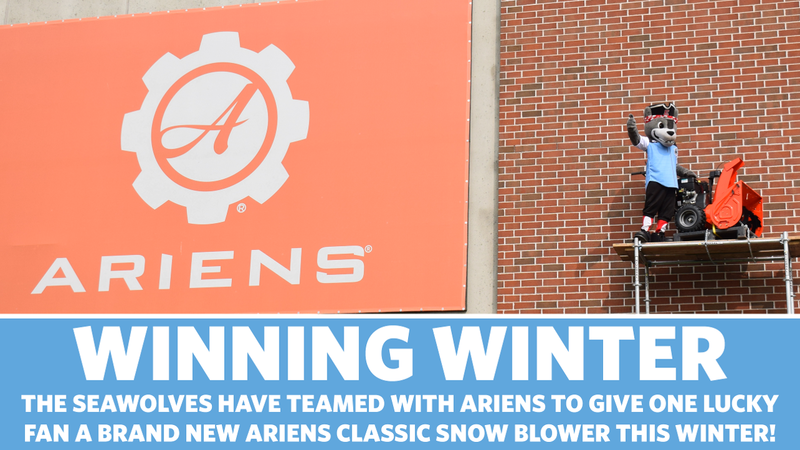 The Erie SeaWolves are pleased to partner with Ariens Company to give one lucky fan a brand new Ariens snow blower this winter. Beginning today (November 19, 2018), fans can head to the SeaWolves' Official Facebook page to predict Erie's December 2018 snowfall total. The eligible fan who is the closest to the official total, without going over, will win a brand new Ariens Classic snow blower. "When your team calls the snowiest city in America home, it's a natural fit to partner with Ariens, the King of Snow," SeaWolves Team President Greg Coleman said. "Winter can be dreary, but that doesn't mean it can't be fun too. We look forward to making one fan's offseason a little easier with a high-quality Ariens snow blower." The winning fan will have Erie's favorite mascot, C. Wolf, deliver their snow blower in early January, 2019. CONTEST RULES: No purchase necessary and one entry per person. Fans must comment on the pinned post at the top of the team's official Facebook page with a prediction of the snowfall total in Erie during the month of December, 2018. To enter, you must be a resident of the following counties (Erie, PA, Crawford, PA, Ashtabula, OH or Chautauqua, NY). Snowfall total is determined by the National Weather Service total as reported at the Erie International Airport on 1/1/2019. Winner will be the eligible contestant closest to the official snowfall total for December 1-31, 2018 without going over. In the case of a tie with multiple correct predictions, one winner will be chosen at random. Winner is responsible for applicable taxes for the snow blower. Contest entrants must LIKE the SeaWolves Facebook page in order to qualify. Predictions on shared posts will not be accepted. Contest must be entered by November 30, 2018 at 11:59 p.m. to be eligible. Based in Brillion, Wis., Ariens Company is a privately-owned and operated corporation focused on outdoor products that serve the needs of both consumer and professional customers. Established in 1933, the company manufactures original outdoor power equipment under the Ariens®, Gravely®, Sno-Tek®, Countax® and Westwood® brands. Click here for more information.